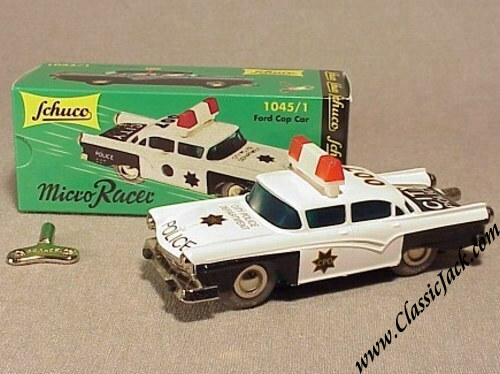 Schuco Micro Racer 1045/1 Ford Fairlane Police Car. The original Ford Fairlane was made from 1958 to 1969. This "Cop Car" version was an elaboration made by Werner Nutz shortly before he died in 1987 and was re-introduced by Schuco in 1997. Comes complete with wind-up key and instruction sheet (facsimile of the original sheet of the 1960's). Measures approximately 5 inches in length (17 cm).